Introducing the fabulously fragrant-flowered foxglove tree, the award-winning Paulownia fortunei Fast Blue (R) 'Minfast'. A sight to behold, the foxglove tree will draw gasps of amazement when in full flower and your neighbours will want to know what it is and where you got it! One of the bluest of the foxglove trees and bred especially for its colour, heady fragrance and giant, furry leaves which can grow to 20cm (8in) and more! More compact and less vigorous than the more readily available Paulownia 'tomentosa', this is a tree more suited to our gardens and holder of the RHS Award of Garden Merit. Supplied as an established plant in a 1L pot ready for immediate planting. The foxglove tree is one of those plants that always draws gasps of amazement when in full flower, it really is a sight to behold in bloom. It's a tree that we're always getting asked if we stock, so we tracked down this garden gem and this is your opportunity to get one of these sought-after beauties for your own garden. 'Fast Blue' grows rapidly (up to 1m (3ft) in a year) and will flower reliably, sometimes in the following year after planting. One of the bluest of the foxglove trees and bred especially for its colour, the flowers are widely funnel-shaped, foxglove-like, very fragrant, deep violet purple outside and almost creamy white inside with yellow throat. Held on erect stems just like our native foxgloves. Flowers have a strong vanilla fragrance and are produced profusely in May and the panicles of trumpet-shaped velvety blooms are a reliable nectar source - a magnet for pollination insects - giving rise to its other name of the Honey Plant. 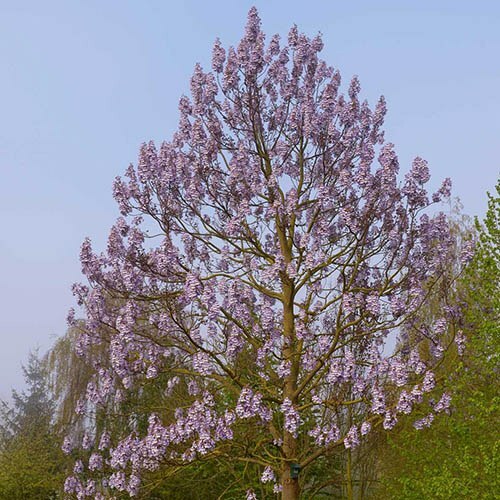 Slightly more compact and less vigorous than the more readily available Paulownia 'tomentosa', this is a tree more suited to our gardens, and has been given the RHS Award of Garden Merit, so you can be sure that it will perform! Plants are also notable for their large, heart-shaped, mid green, deciduous leaves (up to 20cm across), which are very hairy underneath and a feature in their own right after the flowers have faded, continuing to give you garden interest throughout the seasons. Easy to grow in a warm, sunny position, sheltered from strong winds in order to protect flower buds that need to overwinter and also to prevent emerging leaves from damage. Paulownia excels as a specimen tree and is fully hardy down to -25C. When planting, select an appropriate spot with enough space to allow your plants to grow. If you wish to grow Paulownia for the large leaves, then pollarding the tree will produce better growth, although at the expense of flowers. Supplied as an established tree in a 1L pot, ready for planting out. Supplied as an established plant in a 1L pot, ready for immediate planting. Grows to approx 6-8m (20-26ft) high and 6m (20ft) wide in 10 years, flowering normally within 3 years. After flowering, remove dead wood and some low branches or spread too much if necessary. Dig a hole twice the width of the roots, forking over the bottom to loosen the soil, then add some good quality fertiliser, compost or well-rotted manure. We've found that a square hole is better than a round one as the new roots. Holding the tree upright in position with one hand, slowly backfill the hole with soil, so the soil falls back around the roots, then compact the soil around the plant with your heel to ensure good contact around the roots. Support will be needed for at least three years, while the tree establishes. When the soil and air warm up in spring, you should see the plant burst into life. Do not allow plants to dry out. There is no real need to prune trees and shrubs for the first couple of years. Prune established trees in summer using good quality secateurs, removing weak shoots and overlapping branches, to create an evenly spaced bowl shape. Cut branches back by roughly a third. Pruning fruit trees in summer after the fruit has set will encourage more fruit growth the following year. If you want to encourage your tree to grow, the best time to prune is autumn/winter.